ItemE-06022 - "...Mrs. Nellie McClung of Manitou...."
ItemE-04311 - Mrs. Robert Pim Butchart and her son-in-law, William Todd. ItemE-04508 - Pacific Great Eastern Railway bridge. ItemD-09126 - George Rogers Sr.'s home and dairy farm, known as Chesterlea; corner of Rogers Avenue and Douglas Street in Royal Oak, near Victoria. ItemD-09132 - R.C. MacDonald, M.L.A. ItemD-09149 - "Canada Life Building"; Vancouver. ItemD-09152 - "Granville Street, Looking North." ItemD-09153 - "F. McLeod's Store, Victoria Drive"; Vancouver. Item D-09126 - George Rogers Sr.'s home and dairy farm, known as Chesterlea; corner of Rogers Avenue and Douglas Street in Royal Oak, near Victoria. 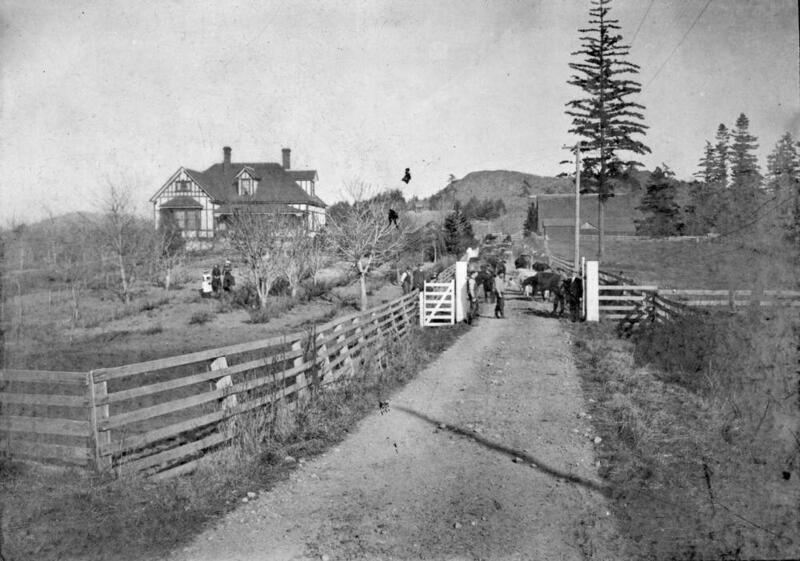 George Rogers Sr.'s home and dairy farm, known as Chesterlea; corner of Rogers Avenue and Douglas Street in Royal Oak, near Victoria.